Summary of financial activities for the year ended June 30, 2014 Our broad base of committed donors provides approximately 81 percent of the national organization’s revenue and 22 percent of affiliate revenue — evidence of our powerful grassroots support. [b] Payments and receipts between affiliates and the national organization have been eliminated. These include dues and rebates. Related adjustments have been made to the balance sheet. Planned Parenthood Federation of America, Inc., is a tax-exempt corporation under Internal Revenue Code section 501(c)(3) and is not a private foundation (Tax ID #131644147). Contributions are tax deductible to the fullest extent available under the law. Planned Parenthood affiliates have similar tax status. [c] The report groups revenue by source (either government or non-government) rather than the manner of disbursement (income versus grants and contracts). Payments from Medicaid managed care plans are listed as “Government Health Services Grants and Reimbursements” to reflect the ultimate source of the funds. The IRS classifies the Planned Parenthood Action Fund as a 501(c)(4) not-for-profit organization. Contributions are not tax deductible. Many Planned Parenthood affiliates operate ancillary organizations with similar tax status. A list of all organizations that received contributions from PPFA during the year that ended June 30, 2014, may be obtained by writing to PPFA, 434 West 33rd Street, New York, NY 10001. Audited financial statements are available on the PPFA website. [a] National organization figures reflect operations of Planned Parenthood Federation of America, Inc., Planned Parenthood Action Fund, Inc. (including its related organizations, the Planned Parenthood Federal PAC, Planned Parenthood Votes, and Community Outreach Group, LLC), The Planned Parenthood Foundation, and Voxent for the year ended June 30, 2014. 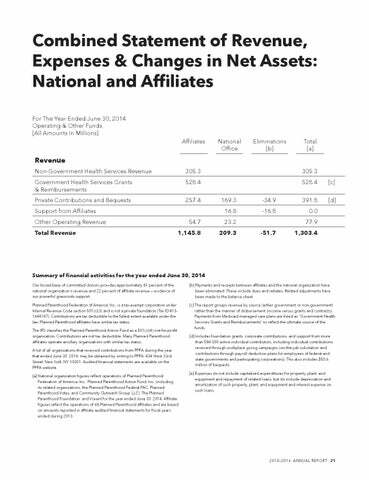 Affiliate figures reflect the operations of 68 Planned Parenthood affiliates and are based on amounts reported in affiliate audited financial statements for fiscal years ended during 2013. [d] Includes foundation grants, corporate contributions, and support from more than 584,000 active individual contributors, including individual contributions received through workplace giving campaigns (on-the-job solicitation and contributions through payroll deduction plans for employees of federal and state governments and participating corporations). This also includes $50.6 million of bequests. [e] Expenses do not include capitalized expenditures for property, plant, and equipment and repayment of related loans, but do include depreciation and amortization of such property, plant, and equipment and interest expense on such loans.